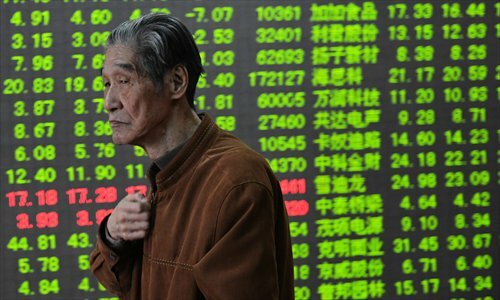 Chinese stock exchanges plunged on Tuesday, with the benchmark Shanghai Composite Index diving by 5.43 percent to 2,856.27 points, and experts have warned that the market could remain turbulent and risky in the short term. The slide came after the Shanghai Composite Index had surged to a 44-month high of 3,041.66 points on Monday, closing at 3,020.26 points. The Shenzhen and Hong Kong stock exchanges also fell on Tuesday. Experts have been warning of potential risks in the market, especially for individual investors, as the recent stock surge was not broad based and was mainly driven by the performance of banks and securities firms. Also, major recent economic data has indicated that the economy is still facing downward pressure. "Institutional investors have made a large sum of net purchases during the past weeks, but the surge can't last forever. Now the market has lost the momentum to back its rise," Dong Deng­xin, director of the Financial Securities Institute of Wuhan University of Science and Technology, told the Global Times on Tuesday. Before the Tuesday slide, the stock market had seen strong gains, with the Shanghai Composite Index rising around 40 percent since the start of July. And in the 10 trading days to Friday, it soared by 18 percent. The surge in the past two weeks was triggered by the launch of the Shanghai-Hong Kong Stock Connect program on November 17 as well as the central bank's decision on November 21 to lower interest rates for the first time in two years, experts said. On Tuesday, daily turnover in the Shanghai and Shenzhen stock exchanges topped 1.27 trillion yuan ($205.3 billion), beating the level of 1.07 trillion yuan on Friday that had set a global record. Trading before 1 pm on Tuesday was mainly purchases, pushing the Shanghai Composite Index up 2 percent and luring in many individual investors. But later in the afternoon, institutional investors began to dump their stocks, according to Dong. "When the Shanghai Composite Index surged to around 3,000 points, many institutional investors sensed the risks and began to dump their stocks before retail investors," he noted. The rise in the market had drawn an increasing number of new investors and many dormant accounts were also reactivated during the past few weeks. China's newly opened stock accounts from November 24 to December 5 reached 97,000 daily, compared with 29,000 in the first 11 months, and peaked at 179,700 on Friday, data from China Securities Regulatory Commission (CSRC) showed Friday. The CSRC also said that institutional investors reported a net stock purchase of 30.9 billion yuan from November 24 to December 4, while individual investors bought stocks worth 65.9 billion yuan, indicating a stronger interest among retail investors. "But it is hard for individual investors to make money in China's stock markets. They should be even more cautious when the market is running wild," Huang Jianzhong, a finance professor at Shanghai Normal University, told the Global Times on Tuesday. Huang also noted that part of the higher turnover came from leverage tools like margin accounts, which allow investors to borrow money from brokers to trade stocks, and this means the stock market is likely to rise and fall much more violently. A Beijing-based investor surnamed Zhang, who opened a margin account on Monday, said that he is not planning to sell the stocks that he bought. "I'd rather wait and see. The stock market is only on a short-term adjustment," he told the Global Times Tuesday. Dong said the Shanghai stock market will see more fluctuations in the future, "mostly between 2,500 to 2,900 points in the short term," he said.